Harrison Ford stars as a Philadelpha detective trying to protect an Amish boy who witnessed a murder in this action-packed and suspenseful drama. 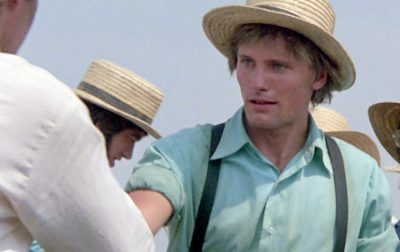 Viggo Mortensen’s role as a young Amish farmer is significant primarily because it was the first movie in which his scenes did not end up on the cutting room floor. Note: a Special Collectors’ Edition DVD was released August 23, 2005. This edition includes a 75-minute documentary, in which several actors, including Viggo Mortensen, are featured. An Oscar-winning film, tense and dramatic, worth seeing with or without Viggo. Mortensen was about 26 years old when this was filmed, though he seems younger.